Eva was born in Paris, France in 1963 and grew up on the beautiful island of Corsica, her family’s original home. She returned to Paris in 1979 to study at the School of Fashion Design. A year later she enrolled at the University of Wisconsin and spent the next four years in Oshkosh, training as an Art metallist with emphasis on black and white photography. She spent 1985-86 back in France, studying painting at the Art Deco School of Nice. 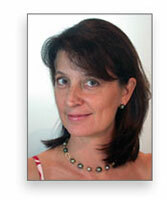 Eva moved to Moorea in 1987 with her husband, Thierry Frachon, and their twin children. Over the years she has participated in several art exhibits in Tahiti and Moorea. 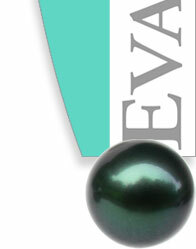 Soon after she settled in Moorea, Eva began a new career in Tahiti’s cultured pearl industry. She first worked with Jean-Claude Brouillet, one of the Tahiti Black Pearl pioneers, starting in pearl sales, eventually becoming a trader. Since 2000 Eva has designed and created jewelry with Tahitian_cultured_pearls, and in 2002 she completed her training with the Gemological_Institute_of_America, becoming an "Accredited_Jewelry_Professional" and "Pearls_Graduate". 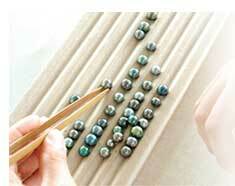 Eva's training as a goldsmith and jeweler helps when giving technical advice, and her artistic training shows her all the nuances of natural color the pearl contains. For more details, see our buying guide.